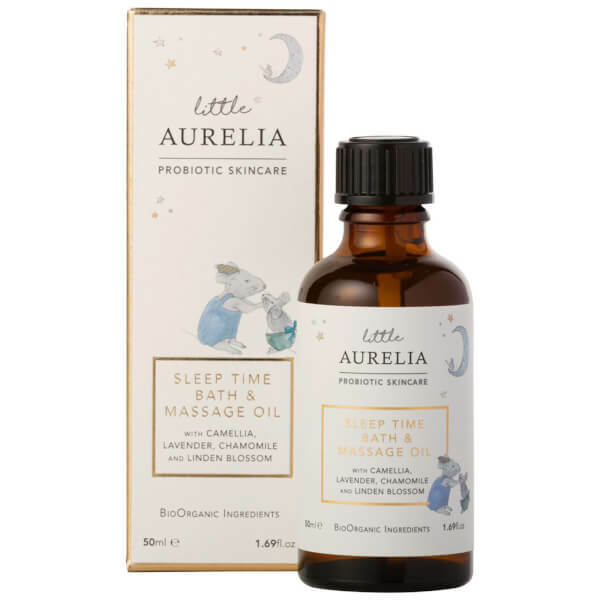 Developed for babies and young children, the Little Aurelia from Aurelia Probiotic Skincare Sleep Time Bath and Massage Oil blends soothing essential oils with gentle yet effective botanical ingredients. Infused with hydrating Coconut, Sweet Almond and Jojoba Oils, the luxurious blend can be added to bath water, or massaged onto skin to soften and condition from top to toe. Sleep-enhancing Lavender and Chamomile make the BioOrganic formula perfect for calming and settling your little one before bed time. In the bath: Add to a warm bath and mix gently to allow the oils to disperse. For massage: Shake the oil into your hands, warm between your palms and apply to your little one’s clean skin from top to toe. Prunus Amygdalus Dulcis (Sweet Almond) Oil, Coco Caprylate (coconut derived), Cocos Nucifera (Virgin Coconut) Oil, Lavandula Angustifolia (Lavender) Flower Oil, Simmondsia Chinensis (Jojoba) Seed Oil, Camellia Japonica (Camellia) Seed Oil, Anthemis Nobilis (Roman Chamomile) Flower Oil, Tilia Cordata (Linden) Flower Oil, Angelica Archangelica (Angelica) Root Oil, Cananga Odorata (Ylang Ylang) Flower Oil, Borago Officinalis (Borage) Seed Oil, Calendula Officinalis (Calendula) Flower Oil, Glycine Soja (Soybean) Oil, Tocopherol (Vitamin E), *Limonene, *Linalool, *Geraniol, *Citronellol, *Benzyl Benzoate, *Benzyl Alcohol, *Eugenol, *Isoeugenol, *Farnesol, *Benzyl Salicylate (*naturally occurring in essential oil).